Like a gentle brain massage administered amidst a lucid-dream-become-hallucinogenic-space-journey, MantisMash’s new album Pulsating Reality takes the psychedelic listening experience thriving within today’s electronic sound scene to a new level by charging it up with bouncy vibes and soothing grooves that reveal the brighter side of modern psy music. Pulling from the realms of IDM, cerebral electronica and even psychedelic rock, this album is best described as psy-glitch meets dreamy mid-tempo, and the result is just as artful and alluring as it is mysterious and mercurial. The opening track,“BasStateOfMind,” politely prepares the listener for the entirety of the album with deep, throbbing bass beats balanced by energized sound particles and cerebral tones that absorb both mind and body. Moving into the song “Folding Dimensions,” which hops between realities with its quickened tempo, slow-moving bass spine, classic guitar samples and trippy sonic artifacts, we quickly fall into an audible journey echoing the complexities of a psychedelic journey. The real heel-tapper of the album is “SquidHop.” Weaving together a platter of bouncy, full-flavored beats and tripped-out psychedelic effects, this track draws upon transformational dance floor vibes to create an amalgam of sound that demands one get up and move. Don’t be surprised if you dance your way into a different dimension with this one. Bolstered by tracks like “Desert Dub” and “Spectralize”—each offering texturally rich mid-tempo environments oozing with auditory hallucinations—Pulsating Reality sips from various electronic genres to create a world ripe for exploration. Wobbly and panning sound effects routinely dip in and out of the presented soundscapes alongside thumpy basslines, echoing computer glitches, organic samples and reverberating digital textures that tantalize the senses at every beat. The title track, “Pulsating Reality,” provides a surreal reprieve from the energy laced into the rest of the album. Like a piece of sonic philosophy, it is equally gentle as it is complex. Slow vibrations and digitized steel strings dance throughout the expansive soundscape as comforting vocal samples and bright data chirps nurture a sense of playfulness reminding one of adolescence and light, carefree indulgence. Though it would be easy to become lost in this dreamy space, dull pulses of bass and consistent wobbling textures keep the mind tethered to the outside. 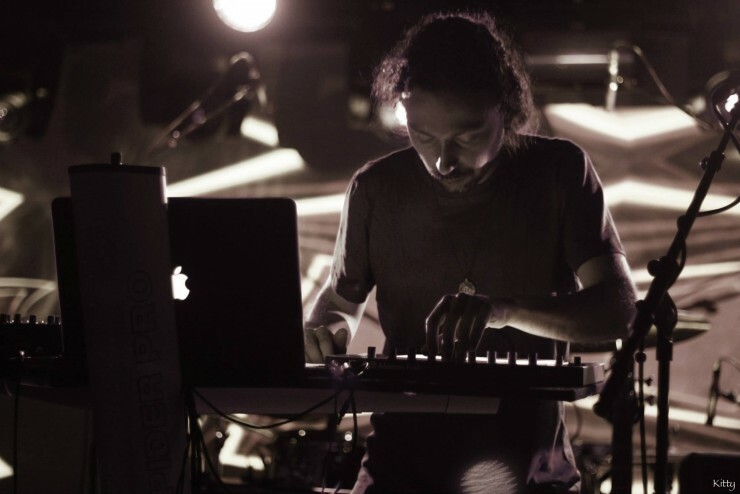 Wandering into the more progressive side of sound, we are presented with two remixes—one track coming from MantisMash and the other from psychedelic instrumental figurehead Ozric Tentacles. Bursting with classic space opera vibes, trippy beat shifts and otherworldly pedal effects, these tracks provide a delicious electro-instrumental departure from the heavy computerized sounds of modern bass culture. Where ManisMash’s remix of Ozric Tentacle’s 1990 track “Eternal Wheel” offers a modern psybass take on psychedelic space rock—this track reminds me of battle music from the 90s video game “Starcraft” with its screaming guitar and spacey sound effects—, Ozric Tentacles’ “Turn of Events” remix showcases a return to the roots of psychedelic music with echoing keyboard, progressive drumming and retro synth components that close the album on an upbeat note. 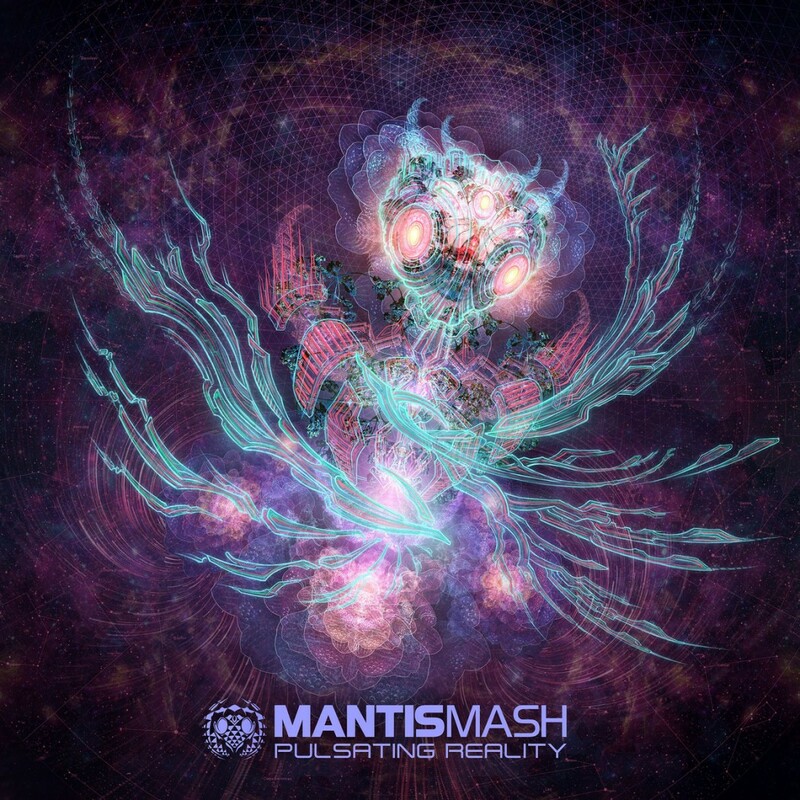 The cumulative effect of MantisMash’s “debut” album is one of advancement and reverence for the sprawling world of psychedelic dance music. A true journey into the realm of mystery, where past and future collapse the present into a self-replicating manifestation of sound and energy, Pulsating Reality dances between realities with rhythm-shifting elegance, sensuous intelligence and uplifting balance. Blossoming with invigorating complexities and consistent, danceable grooves, this is one sonic journey every serious listener should take.